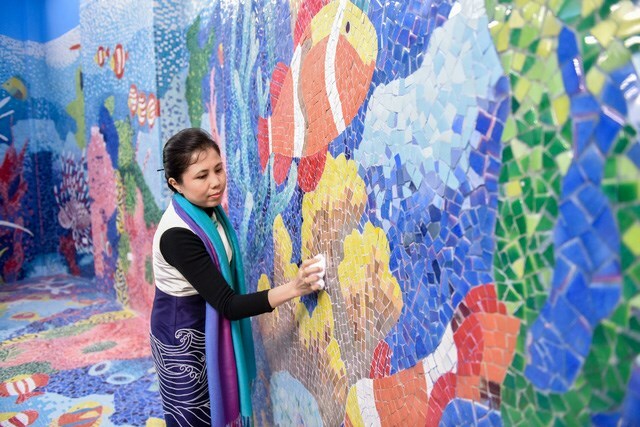 Vietnamese painter Nguyen Thu Thuy has won the silver trophy of the International A’Design Awards & Competitions, the world’s largest and most internationally dispersed design awards event, for her ceramic designs for Mirror House in Hanoi’s Thong Nhat Park. Thuy’s ocean-inspired work was awarded the prize in the category of Social Design for Environment. The Mirror House, or Laughing House, was built in 1979 with support from the former Czechoslovakian government. It was built in the shape of a huge snail shell, with 50 mirrors reflecting distorted reflections of visitors. Last year, the house was in a state of disrepair, with oxidized mirrors, a leaking roof, and damp walls. Hanoi authorities assigned Thuy and her colleagues from the Tan Hanoi (New Hanoi) Company to renovate the House and turn it into an artistic structure decorated with ceramic designs. Thuy is set to visit Como, Italy, in June to receive the prize. Images of the Hanoi Ceramic Mirror House will be exhibited in MOOD Museum during the occasion. This year, the organising board received 1962 nominations from 100 countries in 99 different disciplines of design. The A’ Design Awards were established to raise public awareness of outstanding design practices and principles. The ultimate aim of the award is to build strong incentives for designers, companies and brands from all countries to come up with better products, services and systems that can benefit mankind.